6ounces melting cheese like Chihuahua, Monterey Jack or mild cheddar, cut into 3-inch sticks. The corn and husks. With a large knife, cut through the ears of corn just above where the cob joins the stalk. Carefully remove the husks without tearing, wrap in plastic and set aside. Pull of the corn silk and discard. Slice off the corn kernels and place in the bowl of a food processor. Process the corn to a medium-coarse puree. The dough. Add the fresh or substitute masa to the corn, along with the butter, sugar, salt and baking powder. Pulse the processor several times, then let it run for 1 minute, until the mixture is light and homogeneous. Form and steam the tamales. Set up a small steamer and line it with the smallest husks. Then use the batter to form 12 tamales (it will take about 3 tablespoons batter) filled with several strips of poblano chile and a stick of cheese and wrapped in the largest of the fresh husks (or use 2 overlapping husks if small). Set the tamales in the husk-lined steamer, top with additional husks, cover and steam for 1 to 1 1/2 hours, until the tamales come free from the husks. 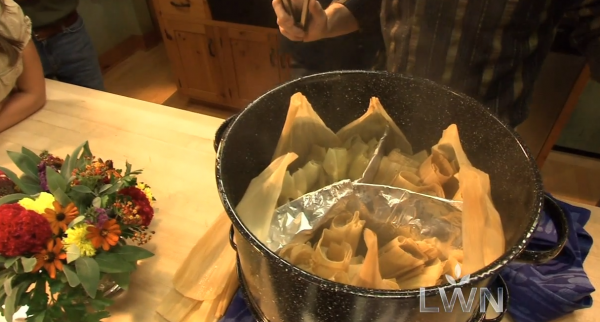 For details on forming and steaming tamales, see recipe for Basic Tamales. my husband is latino and i am filipino,german,and english. i bought one of yor cook books. my husband loves every recipe i cooked from it. he says it taste like his moms food she use to cook for him. Can I make it with creamed corn can? We never tested with creamed corn from a can, so I would not have quantities to give you, but go for it! Give it a try! Really, Katy? Creamed corn would be a disaster! If you can’t get fresh, get fresh frozen; smaller kernels are naturally sweeter. 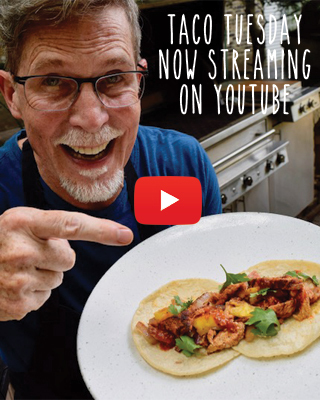 I cant wait to make them….I had these homemade in Mexico with my husband’s family and couldn’t get enough….I want to know if they can be frozen from freshly made? They absolutely can! Cool them completely then freeze! How many cups is two ears of corn? It’s not in season now, so I’d have to use frozen. Love your recipes. Cook them try them out. I am trying sweet corn tamales today. I always trust your recipes. I will follow up with the results. Update: the recipe worked perfect. Fresh corn makes all the difference in the world. Just don’t stuff them with cheese. I trialed a few with roasted red pepper and string cheese (for lack of a white cheese substitute) and it was an epic fail. I just made these. I doubled the recipe and steamed them for 1 hour. They came out perfect, except to cut corners, instead of using a good melting cheese and strips of roasted poblano, I filled them with jalapeno Jack cheese, which I don’t recommend, as the cheese became rubbery and pretty much flavorless. They were still delicious though, to the point of being addictive (I ate 5 in 1 sitting)! The fresh sweet corn in the masa accounts for an indescribable texture that really makes these tamales stand out.